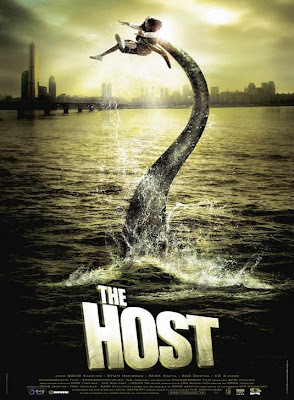 The Host is without a doubt expertly directed, and the star of the film is probably the most interesting creature creation since Stan Winston’s Kothoga (from The Relic), but it never really impressed as much as the films it’s being compared to. These being such iconic fare as Jaws and The Thing. Maybe the hype machine had too much influence, but I think because it is in essence more a drama than a creature-feature, means that it doesn’t quite reach such similar or stellar company. It is it’s own victim in that sense, because while it is a good film, it holds little to offer on repeat viewings like those films do. It won’t let you settle into a specific mood for example. Describing the film is an issue in itself. Director Bong Joon-Ho probably summed it up best himself when he said that it is less a monster movie and more a film about a kidnapping, where the kidnapper just happens to be a mutant amphibian. Stripped to it’s core, The Host is about the importance of family bond and how that bond can shine through during crisis. An already struggling unit, our family - the Parks - must deal with the unthinkable: The youngest and brightest spark in their clan has been taken, presumed dead, not by a man, but by something that just shouldn’t exist. Joon-Ho sets up this idea nicely by having the creature born from nature - and of human interference no less, as opposed to something supernatural or otherworldly. The grounding of the movie in a recognisable family reality is probably it’s greatest strength. Like the Park family, you just accept what happens and deal, and in the end, it’s not that much of a stretch. Various arguments surrounding the reveal of the monster I've always found slightly tenuous because for all it’s refreshing glee, the scene in the park - indeed, the monster itself - is merely the catalyst for the main idea. Besides, when your creature design is this cool, why not show it off more? I actually praise Joon-Hu for being so un-subtle and almost blasé in his approach with this jaw dropping moment. It was superbly satisfying that not 20 minutes into The Host, we see a full shot of the creature diving into the river while curious gawkers scratch their heads, leading into a fantastically directed sequence where our slippery beastie asserts his need for breakfast. Yes, the best bit with the monster (but certainly not the last) is done less than half an hour into the film, but like I said, this isn’t Jaws or The Thing, so being patient is rewarding in different ways here. To it’s credit, The Host still belongs in the same category as the above mentioned films because like them, it’s strengths lie in it’s ability to create a human situation around the monster that’s both compelling and interesting. It just doesn’t do it as well as Spielberg or Carpenter’s respective masterpieces. Unfortunately, it also suffers slightly from the same old genre clichés as well as being a tad too long despite an action packed finale. It remains a 'must see' for it's striking cinematography however, interesting performances which include some great borderline slapstick comedy, a not so flattering portrayal of the US government and of course, the creature itself is worth the price of admission alone.. The identity crisis suffering screenplay does lead you astray at times, but it’s definitely above your average Hollywood blockbuster, and even though being Korean might make it cooler; it doesn’t necessarily make it that much different. But then again, Cloverfield proved that being unique in the monster game, doesn’t always save you from disappointing cliché either. The Host is better than that film, and an overall recommended achievement.